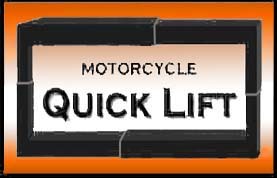 When the Quick Lift designer/engineer/inventor team set out to create a motorcycle tow device that could be carried on a motorcycle, they had no idea how long it would take, or how complicated it would be. As life long on and off road bike enthusiasts, they had personal experiences proving the need for such a device. They were determined to find a way to solve this problem that plagues all bike riders. Their goal was a tow device that was strong enough to safely tow even the largest bike, yet compact enough to be carried on the bike so it was there when it was needed. 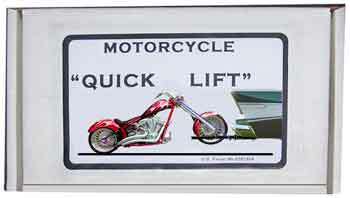 Now, years later, the Motorcycle Quick Lift is the result. In order to get the strength they wanted without extra size or weight, they had to come up with some new, innovative designs and methods. One of these is our patented 45/90 weld created for extra strength and durability. The 45/90 weld, and the heavy gauge square steel tubing used in the construction of the Quick Lift, combine to make the Quick Lift strong enough to tow your biggest bike or trike safely and reliably. The Quick Lift design utilizes the basic principles of dynamics to full advantage. One example of this is the Quick Lift Tow Device's telescoping Handle/Tie Down bar. It might appear logical to skip using the Handle/Tie Down bar and tie the bike off to the vehicle's bumper instead. After all, the bumper is strong and sturdy, and apparently safe. 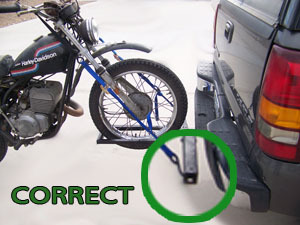 However, the truth is that using a vehicle's bumper causes the weight and force of the towed bike to be directed at the point where the tow device joins the receiver hitch. Using the tie down bar puts the weight and force of the towed bike to be distributed towards the back of the bike, onto the rear tire, where it belongs. This makes the bike more balanced and secure for towing.